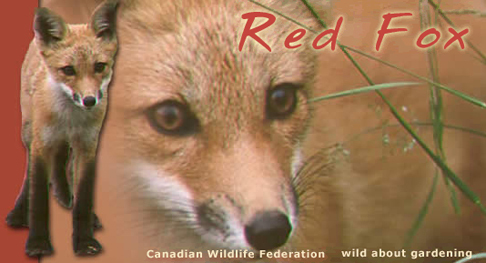 Range: Red foxes are one of Canada’s most widespread mammals, found in all provinces and territories. There are probably more red foxes in North America now than there were when Europeans began to arrive in the 16th century. Habitat: Red foxes inhabit home ranges of 4 to 8 km2 around den sites. Pairs of adult foxes may separate during the winter, especially if hunting is poor, but they come together again in the later winter or early spring for breeding and denning. From autumn until March of the next year, the foxes take shelter in thickets and heavy bush, even during the coldest winter weather. Diet: Probably red foxes eat more small mammals—voles, mice, lemmings, squirrels, hares, rabbits—than any other food, although they supplement this with a wide variety of other foods, including plants. Their diet changes with the seasons. Red foxes are usually, but not always, monogamous. Foxes breed between late December (in warmer areas) and mid-March. After breeding, the foxes seek a suitable den, which is often an abandoned woodchuck burrow, but may also be the burrow of another mammal, a cave, a hollow log, a patch of dense bush, or a customized excavation under a barn or other structure. An undisturbed den may be used by foxes for many years. A single pair of foxes may have two or more dens close to each other. They will sometimes move litters of pups from one den to another to escape danger, although at other times they do so for no apparent reason. Pups are born from March through May. Litter size may range from one to 10 pups, but the average is five. The young are blind at birth, their eyes opening during their second week. Red foxes are patient, solicitous, and sometimes playful parents. At one month, the cubs are weaned, or have made the transition from their mother’s milk to other foods, and begin to play about the den entrance. Both parents hunt for themselves and bring back small game for the cubs to play with. In this way, the cubs learn the smell of the prey and how to eat it. When the young are able to feed themselves, usually at about three months of age, they leave the den site alone. The red fox is often regarded as sly, cunning, and devious but it is actually quite reserved, timid, and intelligent. 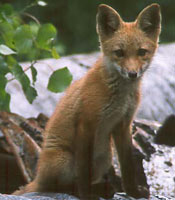 Found coast-to-coast, the red fox is one of the most prevalent mammals in Canada. It belongs to the Canidae family, the family that includes domestic dogs, wolves, and coyotes. Although called red fox, the species occurs in a number of colours including black, silver, and a cross phase that consists of a darker area across the shoulders and down the centre of the back. Despite these colour variations, the red fox is typically an orangish-red with black markings on its feet, legs, and the back of its ears. It has a white belly and a bushy tail that ends with a white tip. On average, adults weigh between 3.6 and 6.8 kg and are between 90 and 112 cm in length (1/3 of which is the tail). Although they have been recorded up to nine years old in the wild, their average life span is only one or two years. The eating habits red foxes vary seasonally. In fall and winter, they feed primarily on small mammals including voles, mice, squirrels, and rabbits. In spring and summer, they switch to berries and invertebrates such as grasshoppers, caterpillars, crayfish, and beetles. Primarily nocturnal in their habits, it is not uncommon to see them out in daylight hours. Red foxes have excellent senses of sight, sound, and smell that they use for avoiding enemies and for hunting. These animals can detect the slightest movement of prey — for example, a twitch of an ear. They can hear the sound of small mammals digging underground and the squeal of a mouse from 150 yards away. They can also smell young prey in nests that are hidden by vegetation. Red foxes are solitary except during the breeding season when they are typically monogamous. After breeding takes place (between January and March), they look for an abandoned burrow, hollow log, cave, or location under a building to use as a den site. They line their den with leaves and other dry material to keep their kits warm. A pair of foxes will often have more than one den in close proximity to each other so that, in case of danger, they are able to move quickly to safety. Other than for raising their young, red foxes seldom use dens. Even in the middle of winter, red foxes lie on the ground , wrapping their luxurious tails around themselves to keep warm. Following a gestation period of approximately 52 days, an average of 4 to 5 (may be as many as 10) kits are born. Newly born foxes weigh only about 100 grams , are blind, and totally dependant on their parents. The kits wean at one month, at which time the mother starts to feed them regurgitated food. Playing around their den entrance, they begin displaying their energetic and curious nature. The vixen (female) and dog fox (male) bring back live food for the kits to play with. This familiarizes them with the smell of prey and teaches them how to hunt and eat live animals. By three months of age, the kits are able to hunt for themselves. They are completely grown by fall, at which time they leave the family unit to start life on their own. They can begin breeding the following spring. Predators of red foxes include wolves, coyotes, dogs, bobcats, lynxes, and, possibly, cougars although humans are likely their main threat. In the past, farmers regarded red foxes as pests. Today, farmers often welcome these creatures on their property. 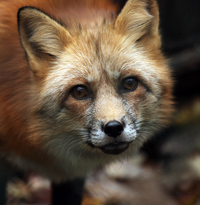 While they may steal a chicken every now and again, foxes consume large numbers of small mammals and insects that otherwise would destroy crops. Many people see foxes as a threat. They believe that these mammals carry disease and that their domestic animals and they themselves are at risk. With education, these fears can be abated. Red foxes rarely attack cats and dogs, although puppies and kittens or small breeds should not be left outside at night. Healthy foxes pose no threat to people. While they are becoming more accustomed to our presence, they seldom show any signs of aggression. As long as they are not cornered, they typically retreat when they detect humans. Foxes can carry diseases such as mange, distemper, and rabies. If you notice a red fox displaying signs of unwarranted aggression, paralysis, mobility problems, disorientation, or extremely friendly behaviour, this may indicate a neurological disease. In these cases, you should contact the police or animal control. Some areas have rabies immunization programs where baits containing the vaccine are dropped near dens. If you do not want to attract foxes to your property, do not leave any food sources, including pet food, outside. Clean up any fruit that has fallen from trees and animal proof compost piles and garbage containers. Many people enjoy having red foxes on their property. Not only do they enjoy watching them, they also enjoy the benefits of having foxes reduce rodent and insect populations. The best way to attract red foxes to your area is to enhance their habitat. They prefer open fields with sandy soil, woodlots, marshes, and vacant barns. They like to survey an area from elevated stands that can be created using logs or grass piles. Make sure you don’t use insecticides, as insects are a primary food source for red foxes. Fruit and berry producing shrubs and trees are also important in their diet. Favourites include blackberries, cherries, grapes, chokecherries, strawberries, and apples. While extensively trapped and hunted in the past, red foxes have rebounded in numbers and continue to add their majestic presence to our landscape. Through education and public awareness, we can learn to appreciate red foxes as the beautiful, intelligent creatures that they are.